TS Govt Junior College Guest Lecturers(JLs) Recruitment 2017, TS Govt Junior College Guest Faculty Recruitment 2017, Contract JLs Recruitment, Guest Junior Lecturers in Govt Junior Colleges. 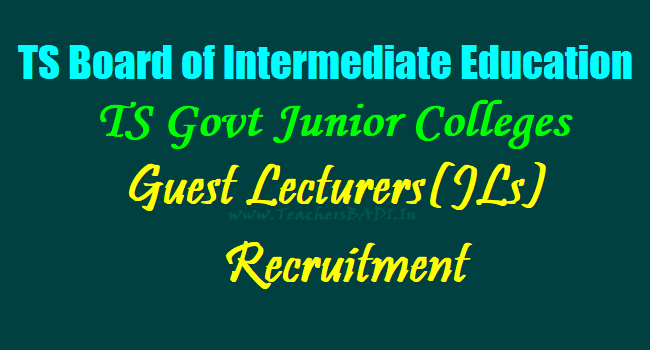 GJC Junior Lecturers application form, Eligibility Criteria, Last date to apply, Selection list, results, Contract Junior Lecturers Remuneration/Salaries and more details on TS Intermediate Board Website. Approval of guest lecturers in junior colleges: Telangana State Intermediate Education Director has given nod for recruitment of Guest Lecturers in TS Govt Junior Colleges for 2017-2018. The order was issued by Telangana Intermediate Education Commissioner to district intermediate education officials on June 6, 2017. Karimnagar: Govt Arts Junior Colleges has given the Guest Lecturers(JLs) Recruitment 2017 and applications are invited from the eligible and interested candidates. In the Telangana State, for the first time in government junior colleges, vacancies will be hired in GJC vacancies. There are about 1,000 guest lecturers at the 405 government junior colleges. JLs posts not to be directly filled by the Principal but directly to these posts to be recruited by the issuing recruitment notifications . An application forms to be received by from the candidates directly. The recruitment guidelines have to be appointed as guest lecturers in accordance with the rules. The state government did not permit the appointment of new posts in the contract lecturer vacancies and hence the appointment of a guest faculty in these vacancies of Govt Junior Colleges. The salary for each guest should be paid not more than Rs 150 per period for a period or for each guest faculty, a maximum of Rs 10 thousand per month is to be paid. They can be appointed from June 1, 2017. A post Graduate Degree in the subject concerned (or its equivalent) with at least 50% marks in aggregate from a University recognized by the UGC. Incase of SC/ST/BC/ Differently abled candidates, the minimum marks shall be 45%. And Bachelor of Education (B.Ed) or BA. B.Ed/B.Sc., B.Ed., from any institution recognized by NCTE with the subject concerned as a Methodology subject. Further details can be had from the website www.tsbie.cgg.gov.in.